Today, Fox Chase Cancer Center proudly announced that it has again been ranked among the top cancer centers in the country by U.S. News & World Report—coming in at 30th in the nation for the specialty of cancer care. 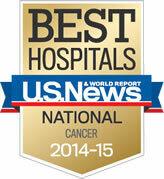 Additionally, Fox Chase was ranked as high performing in the specialty areas of gynecology, nephrology and urology. Among all hospitals, it also ranked 11th in Pennsylvania and 7th in the Philadelphia metropolitan area.